For the period 2017-2019, Ladies Circle International will support the ‘Happy Hearts’ project in Botswana. The project seeks to raise funds to build an interim home. The home will accommodate children undergoing treatment at Princess Marina Hospital in Gaborone and their caregivers. The home intends to cater for those patients that live far from the treatment centre. Ladies Circle Botswana has partnered with the Cancer Association of Botswana; an organization dedicated to supporting and caring for the sufferers and survivors of cancer and recognizes the lack of such a facility for children in the country. Childhood Cancer is on the rise in Botswana and the main treatment centre is located in Botswana’s capital city, Gaborone, at Princess Marina Referral Hospital. A majority of the diagnosed cases are from children who reside outside of the capital city (Gaborone) where the main treatment centre (Princess Marina Referral Hospital) is located. Ladies Circle Botswana came to the realization that there were some childhood cancer patients and their caregivers that have to travel long distances of over 1000kms using public transport to Gaborone for treatment. As a majority of the diagnosed cases are children from very low income families, travelling the long distances and finding accommodation in Gaborone to access the treatment can prove to be very costly for the affected families. At times they have to travel on a monthly basis for treatment, and given their health, financial means, the children and caregivers are subjected to extremely tough, unfavourable conditions of travel and care during and after treatment. 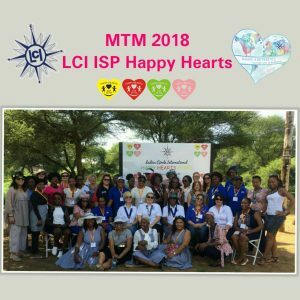 The mission of Happy Hearts is to provide temporary accommodation for childhood cancer patients and their care givers from remote areas who have to undergo cancer treatment in Gaborone. After its completion, the plan is that home will further provide a range of services to address patients’ physical, psychological, social and educational needs. 1)To offer a dignified home away from home accommodation for patients during their treatment period and avoid exposure to further side effects and risks. 3)To provide an environment that will support and against psychosocial burdens for the patient and caregivers and equip them with better copying skills.